WinDetect is an antivirus and anti-malware program that searches Windows PCs for malicious files. WinDetect detects viruses, root kits, keyloggers, trojans, spyware, downloaders, and other kinds of malware by examining selected executable files and registry keys in Windows installations. WinDetect can also disable many of the files it finds. WinDetect completes scans of your PC quickly and can be used along with other antivirus programs. WinDetect is recommended for advanced computer users who can recognize malicious, unwanted applications or are willing to do additional research to determine if files are malicious. You should be cautious when disabling suspicious files with WinDetect. You can only restore disabled files if you created a Windows restore point before disabling them. See Create a Windows system restore point below. WinDetect finds suspicious files on your Windows PC, but it lets you decide what to do with them. WinDetect can disable many of those files if you determine they are dangerous. WinDetect is safe to use on your computer. Every WinDetect installation file is digitally signed with a code certificate issued by Comodo Group. The certificate verifies the source, authenticity, and integrity of the software. If you attempt to run a software file and a certificate is not present, Windows displays a security warning stating the publisher could not be verified. WinDetect examines selected files and registry keys in Microsoft Windows installations. It flags files that fail to pass any of multiple heuristic tests designed to detect malicious applications. When WinDetect finishes running, it displays a list of suspicious files. By selecting any file in the list, you can see why the file was flagged and whether WinDetect can disable it. If you decide to disable a file, only a few additional steps are required. WinDetect creates a log of the files it examines. You can upload the log to HeavenWard, where it is quickly evaluated using additional heuristic tests and checked against multiple, up-to-date malware data bases. Those tests may detect additional dangerous files. The report provides additional information about all suspicious files found on your system and will help you make decisions about disabling them. You can also access information about specific files using links in WinDetect as described later below. WinDetect takes no action to disable files unless you instruct it to do so. In addition, when WinDetect disables a file, it does not modify or delete it. Instead, WinDetect terminates the file if it is running and then effectively uninstalls it by modifying the registry keys that cause it to run. WinDetect searches selected Windows directories and registry keys and then uses multiple sets of rules to flag suspicious files. Executables currently in memory are also examined. A WinDetect search and evaluation is relatively fast, since it uses a smart search protocol and does not rely on virus data-base information. WinDetect selectively tests certain executable files (and disguised executable files). WinDetect also evaluates executables currently in memory and searches the Windows registry for registry keys related to executables. class of file: executable, service, driver, module, etc. WinDetect creates a compressed version of the file and registry information it gathers from your computer. When you upload the compressed log to HeavenWard, additional heuristic tests are performed on its contents. The files in the log are also tested against up-to-date information from multiple malware databases. Thus, the online evaluation may spot suspicious files that the WinDetect application did not identify. Results of the online evaluation are sent to your browser within seconds after WinDetect uploads the log to HeavenWard. The report provides additional information about all suspicious files, including their risk levels, locations, actions, and specific characteristics. Each file description links to a page with more detail and links to reports from other malware detection services. The page is optimized to help you search for information online about any file. Information identifying your computer is removed from the log before it is analyzed. Download and run the WinDetect set up file, windetectsetup.exe. WinDetect will install in C:\Program Files\HeavenWard\WinDetect. Start WinDetect by clicking start > Programs > HeavenWard > WinDetect. You can also double click windetect.exe in the program folder. Search/search again: runs a WinDetect search and can be used at any time. View suspicious files: displays the list of suspicious files, called the Technical Summary. Disable: disables the file(s) selected in the list of suspicious files. View disabled files: displays a list of successfully disabled files, called Removed Items. Upload - currently disabled: uploads individual files to HeavenWard for manual analysis. This feature will be available in future versions of WinDetect. Help: Displays About WinDetect information and a link to WinDetect’s online user guide. The left panel, or List Panel, displays either of two lists, the list of suspicious files most recently flagged, called the Technical Summary, or the Removed Items label indicating that the right panel contains information about removed files. The right panel, or Information Panel, displays several kinds of content, including information about files selected in the left panel, a link (Find) to additional file information hosted by HeavenWard online, or dialogs for uploading WinDetect’s log or individual files to HeavenWard for evaluation. When Simple mode is selected, WinDetect flags fewer files, but they are likely to include truly malicious files found on your installation. When Expert mode is selected, additional files are flagged. However, many of the additional files are likely to be safe and should not be disabled. Once a file is disabled by WinDetect, it cannot be restored unless a Windows restore point was created before disabling the file. Beginners should get all available information about suspicious files before disabling them. Also, it is wise to run WinDetect again after disabling files since some malware is highly resistant to modification and may continue to run. Select Simple mode or Expert mode. Carefully evaluate suspicious files flagged by WinDetect to determine which should be disabled. If you are unsure whether a file is malicious or safe, create a Windows restore point before disabling it. Disable the files you believe are malicious. Confirm that the files have been disabled. Reboot your computer and run a WinDetect search again to make certain malicious files have been successfully disabled. Start WinDetect. Start WinDetect by clicking start > Programs > HeavenWard > WinDetect. You can also double click windetect.exe in the WinDetect program folder located in the HeavenWard program folder. Select Simple mode or Expert mode. ﻿ When Simple mode is selected, WinDetect flags fewer files, but those usually include truly malicious files found on your system. 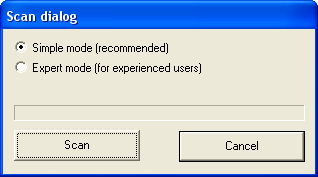 When Expert mode is selected, additional files are flagged, but they tend to be safe, and most should not be disabled. Run a WinDetect search. To run a WinDetect search, click Scan. When WinDetect completes its search, a list of suspicious files found on your computer, the Technical Summary, opens in the List Panel. To view information about any suspicious file, select it in the List Panel and look in the Information Panel. Find additional information about a specific file by selecting it in the List Panel and clicking Find in the Information Panel. HeavenWard’s resource page for the file opens in your browser. The page is optimized to help you search for additional information about the file online. (Highly recommended) Conduct additional heuristic tests and additional checks against multiple data bases by uploading the information in WinDetect’s log file to HeavenWard. ∑ Technical Summary in the List Panel and follow the instructions shown in the Information Panel for uploading the compressed (.gz) file containing the log. Soon after the file is uploaded, results of HeavenWard’s analysis open in your default web browser. (Currently disabled) Future versions of WinDetect will allow you to upload individual suspicious files to HeavenWard for manual analysis. Click and follow the instructions shown in the Information Panel. The manual analysis is completed as time allows. Results are emailed to you. Disable the files you decide are malicious. Click to view the suspicious files found on your computer (the Technical Summary) in the List Panel if they are not already displayed. WinDetect can disable files with a black check box  but not ones with a gray check box . You can also look in the Information Panel to see if any file selected in the List Panel can be disabled by checking its Removal Status. Select the check box(es) for the file(s) you want to disable. Then click . The Remove items dialog opens. Read the notice in the dialog. Then click Yes to disable the file(s). Confirm that the files have been disabled. After WinDetect attempts to disable a file, the Removed Items list opens in the Information Panel. Items in green and labeled ok are successfully disabled. Items in red and labeled failed are not disabled. To access information online about the files and registry keys shown in the Information Panel, click View Details. Reboot and search again. Some malicious files are designed to be difficult to deactivate. Therefore, after disabling files it is always wise to reboot your computer, run a WinDetect search again, and recheck the status of the file(s) you disabled. The status of file(s) you attempted to disable is shown under ∑ Technical Summary in the List Panel, where disabled files are marked with a black X. If you have questions about running WinDetect not answered here, you may submit them to HeavenWard Support at support@hwsuite.com. RemoveAny Virus Base, http://virusbase.free-anti-spy.com/en/index.php. Browse information on known suspicious files or search for additional information using file names or checksums. The file checksums shown are MD5 hashes. virustotal, https://www.virustotal.com/#search. Use the MD5 file hashes from HeavenWard’s online reports to search multiple malware data bases. © 2015 Valery Kuzniatsou. All Rights Reserved.